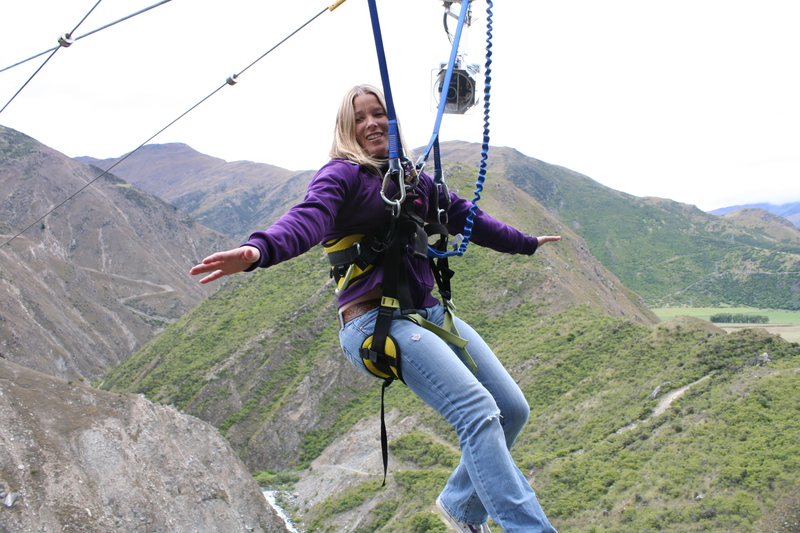 Taking the plunge and doing the Nevis Arc in Queenstown, NZ. A heavy feeling has been washing over me. It’s pressing on every panic button I have. Every single one. If I wasn’t so damn distracted with ignoring my own disconnection from the world I would most likely be freaking out right now. But I’m not freaking out, I’m actually kind of piqued. Everyday lately I have been hit with the “purpose” bat. It’s in the movies, it’s in random quotes, it’s in people’s status updates. Purpose. For the past year and a half my purpose was very basic – to survive. And now that I’ve kinda mastered that I’m wondering what else there is. And I’m wondering where my decision-making genius has been coming from. Why I uprooted my life and moved to San Diego when it seemed like the most destructive thing I could do. Why I’m leaving to New Zealand tomorrow for a mere four month work jaunt – to the country I left to that last winter I had Dave. Where is my reason coming from? I’m completely unaware of its source. And do I have any purpose, any objective … lurking in some depth of my consciousness? But consciousness is so far from what I have felt of late. In the past week I have been more aware than ever of how introverted I have been. And how dark and messed-up the webs of my thoughts have been. Auto-pilot got me through the days whilst I spent all my mental energy untangling the mess in my head. The time for auto-pilot is over. I am more than capable of getting myself through the days now. I’m tired of hibernating. I’m tired of licking my wounds. I’m tired of the darkness. I have scars. I get it. I will always miss Dave, and I will always have a profound understanding of loss. But I want a life again. I don’t want to live in my head anymore. Perhaps this next stage of my journey is to uncover my purpose. Perhaps I am meant to be in New Zealand so I can figure out where I need to go and what I need to do. So I can make new decisions and reinvent my life. So I am forced to start living amongst so much familiar unfamiliarity. And so I have no excuses to dwell in the darkness. It’s mostly sunshine and lollipops there. And now that I’m on my own again, and beginning to be at peace with that, I think I need to take advantage of it. And besides, there are some perks to being on my own in a foreign land. This time around I’m single in New Zealand – the adventure capital of the world. I could really use a good adventure. Next stop – Motueka. The adventure begins. Don’t panic. Fly free ladybird! SO very excited for you and the adventure that awaits you at every corner and every breath you take. Don’t fight the panic … sip at the breaths if they come fast and heavy, and uncertainty / fear sets in. You have the strength to conquer anything (you’ve shown that). The biggest challenge right now may be to let your heart soar freely and open up to the potential and possibility that is bound to emerge. Wishing you stillness, quiet and solitude of thought in the chaotic transition of newness and change. Happiness for yoU!! Travel safe friend. Hope you have a blast! !